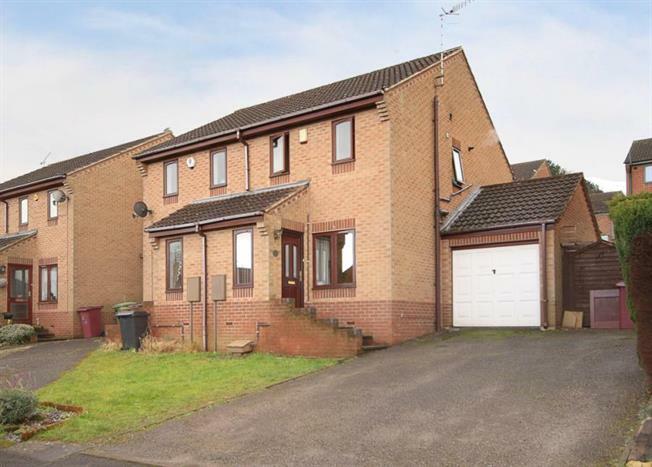 2 Bedroom Semi Detached House For Sale in Chesterfield for Offers Over £140,000. Please don't miss the chance to view this beautifully presented two bedroom semi detached property occupying a ideal position on a quiet cul de sac in the ever popular area of Wingerworth. Briefly the property comprises of entrance door leading into the porch with access into the living room. The modern kitchen benefits from a range of wall and base units and views over the rear garden. Stairs lead to the first floor landing with access to the two bedrooms and bathroom with w.c, wash hand basin, heated towel rail and bath with shower above. The low maintenance garden to the rear with paved seating area. This property truly needs to be viewed to appreciate the standard of the accommodation on offer. Wingerworth is a popular residential area with excellent local amenities including Doctors Surgery, local shops village hall, and public houses. there are two local primary schools both highly regarded with good reputations. The village lies within easy reach of the towns of Chesterfield and Alfreton and the cities of Sheffield, Nottingham and Derby are within commuting distance. There is a good bus service to surrounding towns and the M1 motorway is within easy reach.